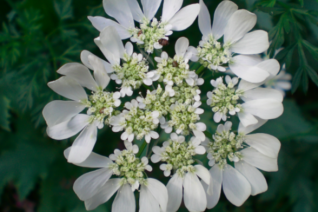 WE LOVE white lace flower with its beautiful pristine white umbels held high above ferny green foliage. A true hardy annual native to the mediterranean. It makes a wonderful swath of lacey white to 18″-20″ tall. Long stems are ideal for cutting and this flowers lasts in vases wonderfully. Blooms repeatedly from late spring to mid summer.. Cut spent flowers and they re-bloom. Open disturbed soil that has been well dug- and a little organic fertilizer to spur vigor. Full sun. Borders, cutting gardens, cottage gardens- virtually anywhere. Re-seeds in open disturbed soils (no competition). Light summer water.